Cardiomyopathy refers to changes in the heart muscle. These changes prevent part or all of the heart from contracting normally. 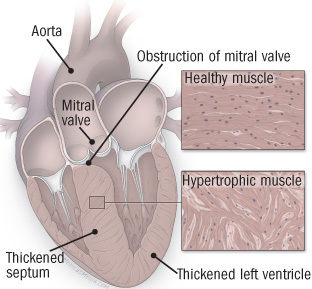 Hypertrophic cardiomyopathy — The muscular heart wall thickens abnormally. As a result, the heart muscle cannot relax fully. As a result, the heart does not fill up with as much blood as in a healthy heart. So the heart has less blood to pump out to the body. There is another problem with hypertrophic cardiomyopathy, as well. The heart muscle wall can become so thickened that it blocks the flow of blood out of the heart. Both of these problems can lead to heart failure. Restrictive cardiomyopathy — Various diseases can cause substances to be deposited where they do not belong: in the heart muscle. 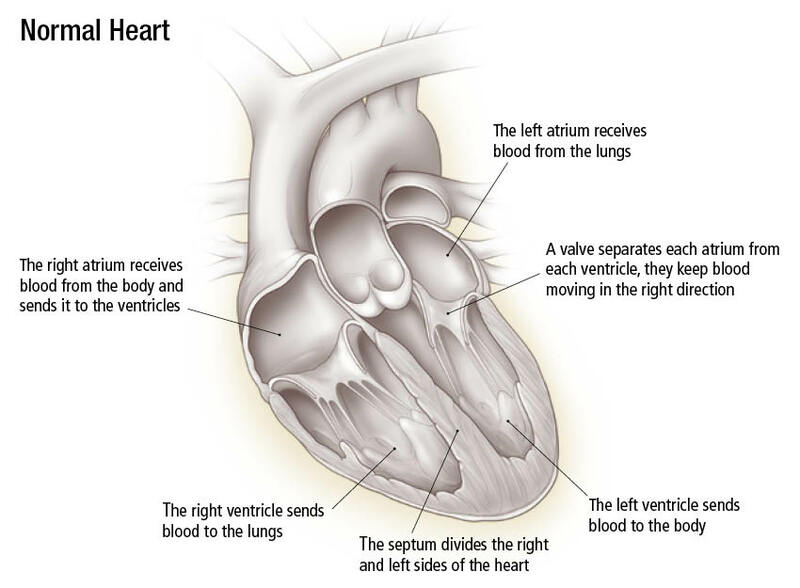 This causes the heart's muscular walls to become so rigid that the heart cannot expand to fill up with all the blood that is returning from the body. The result is that the heart does not have as much blood to pump as the body needs. The symptoms of cardiomyopathy vary by type. Hypertrophic cardiomyopathy — Symptoms, when they occur, are usually the same as the symptoms of dilated cardiomyopathy. Sometimes, the first symptom may be fainting or even sudden death. The condition also can cause chest pain, usually during exercise. Restrictive cardiomyopathy — Fluid accumulates in the legs and abdomen. This condition also can cause shortness of breath, especially during exertion. Your doctor will review your medical history. Your doctor will examine you, paying special attention to your heart. An electrocardiogram (EKG). This test records the electrical activity of your heart. An echocardiogram. This test uses sounds waves to create a picture of the heart at work. Dilated cardiomyopathy sometimes can be reversed if it is caused by a treatable condition. Most cases of hypertrophic and restrictive cardiomyopathy are persistent. They can get worse over time. The best way to prevent cardiomyopathy is to prevent the diseases that cause it. Know your risk factors for coronary artery disease. Modify those risks early in life. Keeping blood pressure normal. Eat a diet rich in vegetables and fruits. Take medication as needed. Drinking no more than two alcoholic beverages per day. Do not drink alcohol at all if you are at high risk of dilated cardiomyopathy. If you have any family members with inherited cardiomyopathy, contact your doctor for an evaluation. Medications that prolong life in people with dilated cardiomyopathy. Drugs that improve the symptoms of heart failure in dilated cardiomyopathy. Drugs that help to relax the heart muscle in hypertrophic cardiomyopathy. Antiarrhythmic drugs to correct abnormal heart rhythms. A pacemaker or an implantable defibrillator to prevent fatal arrhythmias. For patients with hypertrophic cardiomyopathy, blockage to the outflow of blood can sometimes be reduced. This is done by damaging part of the muscle between the two ventricles. This damage can be created at surgery or through a catheter. A heart transplant may be necessary for patients whose poor heart function has become disabling or life threatening. Call your doctor immediately if you have chest pain. Call even if you think that you are too young to be having heart problems. The outlook varies. It depends on the specific cause and severity of the cardiomyopathy. The survival rate of people with most types has improved dramatically in the past decade. This is due to the increased number of treatments available.